Financial management software provider Intacct recently held its seventh annual user conference. In addition to a long list of enhancements in current and upcoming product releases, the company used the occasion to announce Intacct Collaborate, a capability built into its software that enables finance and accounting organizations to work together to answer questions or resolve issues while performing a process. 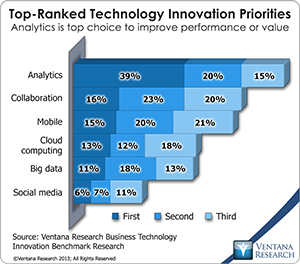 Our benchmark research shows that collaboration ranks second in importance behind analytics as a technology innovation priority. Collaborative capabilities in software will multiply over the next several years as software transitions from the rigid constructs established in the client/server days, which force users to adapt to the limitations of the software, to fluid and dynamic designs that mold themselves around the needs of the user. A while back, I noted that finance and accounting organizations need collaborative capabilities although they might not realize it. At the same time, finance departments have their own requirements for these systems that reflect the character and constraints of the work they do. This means narrowcast, not broadcast, feeds (Finance doesn’t want a Facebook or Twitter experience because it considers much of what it does to be confidential) and in-context collaborative capabilities to simplify the working environment. Financial management software provider Intacct recently held its fourth annual user conference. In addition to a long list of enhancements in current and upcoming product releases, the company used the occasion to announce Intacct Collaborate, a capability built into its software that enables finance and accounting organizations to work together to answer questions or resolve issues while performing a process. Our benchmark research shows that collaboration ranks second in importance behind analytics as a technology innovation priority. Collaborative capabilities in software will multiply over the next several years as software transitions from the rigid constructs established in the client/server days, which force users to adapt to the limitations of the software, to fluid and dynamic designs that mold themselves around the needs of the user. A while back, I noted that finance and accounting organizations need collaborative capabilities although they might not realize it. At the same time, finance departments have their own requirements for these systems that reflect the character and constraints of the work they do. This means narrowcast, not broadcast, feeds (Finance doesn’t want a Facebook or Twitter experience because it considers much of what it does to be confidential) and in-context collaborative capabilities to simplify the working environment.